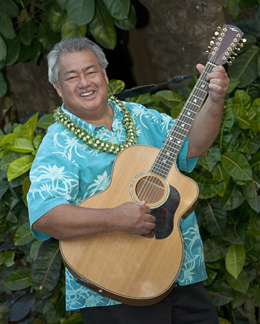 George Kahumoku, Jr. has won multiple Grammy awards for his masterful performances on slack-key guitar. Tonight he’ll play and sing at the Freight, mixing Hawaiian classics and contemporary songs with his own captivating originals. We might even get to hear him do “Unchained Melody” Hawaiian style. George has amassed an outstanding body of work over the years, with more than 25 albums, including collaborations with Bob Brozman, Daniel Ho, and the late Norton Buffalo, and three Grammy-winning compilations of slack-key performances culled from a weekly concert series he hosts in Maui. We’re lucky to have George bring his earthy vocals and unique 12-string slack-key sound to Berkeley for a celebration of the unique music and culture that is Hawaii.